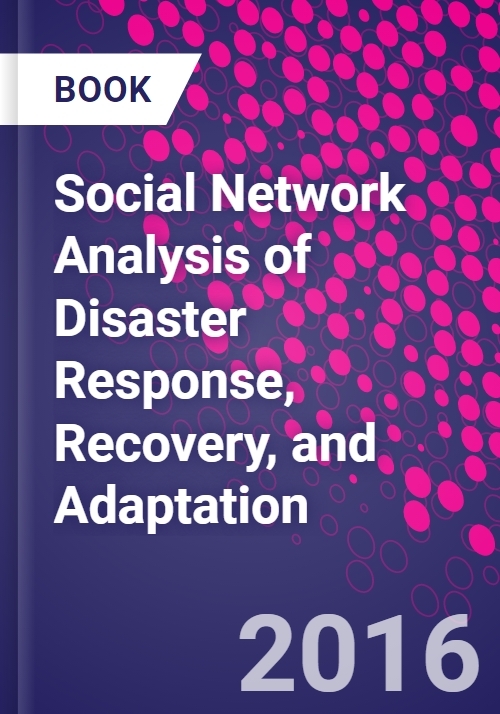 Social Network Analysis of Disaster Response, Recovery, and Adaptation covers systematic social network analysis and how people and institutions function in disasters, after disasters, and the ways they adapt to hazard settings. As hazards become disasters, the opportunities and constraints for maintaining a safe and secure life and livelihood become too strained for many people. Anecdotally, and through many case studies, we know that social interactions exacerbate or mitigate those strains, necessitating a concerted, intellectual effort to understand the variation in how ties within, and outside, communities respond and are affected by hazards and disasters. Eric Jones is an Assistant Professor in the School of Public Health at the University of Texas Health Science Center at Houston. He received his B.A. in Political Science from Hamline University in Minnesota and Ph.D. in Environmental and Ecological Anthropology from the University of Georgia. His research interests generally concern how people work together. More specifically, he has examined collective action or cooperation in exchange, rural production, adaptation to extreme events, wellbeing in vulnerable populations, and how non-scientists engage science. Most of this work has involved social network analysis to understand how individuals or groups interact. In order to support theoretical and analytical needs of his work, he also has been involved in software innovation for social network applications. AJ Faas is Assistant Professor of Anthropology at San Jose State University. His work focuses on exchange practices, social organization, organizational practice, and epistemology in contexts of environmental crisis--disasters, displacement and resettlement, development, and violent conflict.. His has principally conducted research in Mexico and Ecuador, but also in the United States and China. He is a founding member of the Risk and Disasters Topical Interest Group at the Society for Applied Anthropology, where he has organized more than 200 panels on the applied social science of risk, hazards, and disasters.